Sonny Bill Williams has played international rugby league and rugby union for New Zealand. Sonny Bill Williams took a break from All Blacks training in Cardiff to witness the birth of his first child in New Zealand. The Chiefs centre, 29, missed a session on Tuesday morning to watch via computer as his wife Alana Raffie gave birth to a daughter. The couple have not named the child, and mother and baby are doing well. "Sonny wasn't training simply because he was monitoring the progress of his wife," said assistant coach Ian Foster. 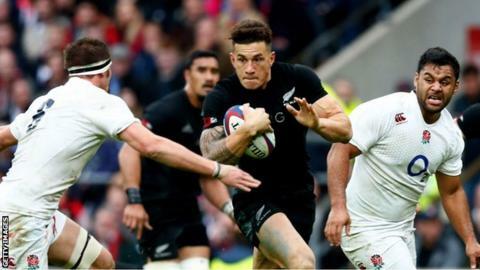 New Zealand play Wales in Cardiff on 22 November, with Williams in the running for selection after starting in the 24-21 defeat against England and coming on as a replacement in the 24-16 win over Scotland. "We're delighted Sonny and his wife Alana had a little baby girl this morning and he was following that event so we're delighted," added Foster. "The family's good and it's all on top of [prop forward] Charlie [Faumuina] and Michelle's second child last week, so it's been a week of celebration for the All Blacks with babies." Williams - a dual code international and a former heavyweight boxer - committed to tour with the All Blacks knowing his wife was likely to give birth while he was in the northern hemisphere.